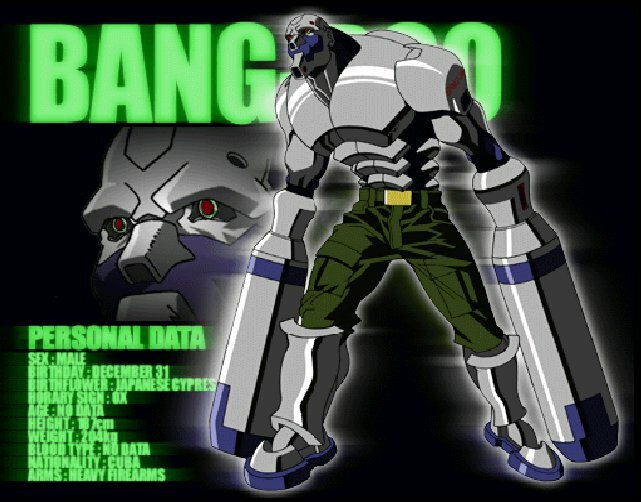 Bang Boo is a cyborg who was created by the Gerard Foundation, a criminal organization, as an instrument of war. He was eventually given orders to enter the fourth Toshinden tournament as part of Genma's team. He was also commanded that if Genma managed to gather all of the Four Sacred Arms, he would then need to be assassinated. To go along with his catchy name, Bang-Boo is a pretty original and cool design visually... easily one of the most original designs from Toshinden 4. He's got a few interesting moves, include a "back laser"... literally, a laser that comes out of his back. lol. He also has a "Proton Cannon" super move exactly like Iron Man from the VS Series.